We will have Michael Kinney on hand for Big 12 Media Days this week bringing you coverage from the events. It’s been a couple weeks but Alex has some notes below very much worth the read on some Sooner commits and others that he saw at the Opening. Spencer Rattler – First thing I thought when I saw Rattler, was he just seems extremely confident in himself. Rockin the OU visor the entire camp, loved how quickly the ball jumps out of his hands. His release is easy. Showed that he can make all the throws and has plenty of arm strength. One of the main things I liked about him is how he always keeps his feet/base moving and squared underneath him which definitely plays into how accurate he is as a passer. Never saw him release a ball that made you think, ‘what the heck was that’. In the first game of the 7v7 tournament that Team Overdrive lost, he seemed to not trust his eyes all of the sudden or just not want to take what was given to him which in turned cost him greatly. On one of the interceptions he threw, he had Wease underneath wide open, but instead of dumping it down to him lifted his eyes to Henderson and tried to force it. Watched him in this game repeatedly look at guys who had windows for him to throw into but for some reason kept holding onto it. After this game though he got back to being him and as you know, led his team to the championship playing smart, taking what was given too him and making some big time throws along the way. He will have to put on some weight once he gets to Norman as he is pretty lean at 6’1″ (looks closer to 6′) and 173-pounds but Wylie should be able to take care of that. Basically the Sooners got the best quarterback in this class who will be fun to watch. Dax Hill – What’s not too like about the young man? Tests off the charts but isn’t just a workout warrior as I got to see him go through a few 1v1 reps as well as some 7 on 7. Love the size he brings with the broad shoulders and see plenty of room to add some more solid weight to him. Standing 6’0.5″ currently and 187-pounds he will be 200 in no time after he hits a college weight room. Clocked a 4.40 laser after clocking a 4.30 at the regional and was an inch away from being named the fastest at the event. But he isn’t just a straight line speed guy as he showed off how fluid he is on a double move in coverage as you will see below. Trejan Bridges – Man, I’ve been in this industry for a while and I can’t think of anyone I have seen up close that I thought had better ball skills than this guy. Catching the ball isn’t just natural for Bridges, it’s flat out effortless no matter the location of the ball or the velocity behind it. Dude has NFL level ball skills right now. Showcases nice burst up field and great ability to adjust to the ball in the air. Flat out great body control off the ground as well. See someone who can play inside and outside at the next level. His feet and suddenness in his routes make him difficult to match up with. With some added weight, think you will definitely see him playing as a true-freshman in Norman Fall of 2019. Theo Wease Jr. – This guy can do it all. But one of the areas he really excels is with his smooth route running ability. I tweeted about it on the last day of the camp, he just doesn’t move like he is 6’3″ and 202-pounds. With the size he brings seeing some stiffness wouldn’t be out of the norm, but with Wease you see a fluid athlete. Love how well he can drop his hips in and out of his breaks. Impressive foot quickness off the line and shows the speed to separate at the top of the route. And this isn’t against average corners either. Plucks with ease with a wide catch radius. Wease will provide the Sooners with a big, physical red-zone target that they have lacked in their offense really since the Malcolm Kelly days. Evan Neal – A massive, mountain of a young man. Think Orlando Brown 2.0 but with better agility at the same stage which is a scary thought to think about. He stands at 6’7.5″ and 360-pounds but carries it well. Obviously he will most likely trim up at the next level 20-25 pounds or so and play around the 335 range is my guess. But look at how well he bends at the knees in the clips below. A lot of times guys this big are waist benders and just kind of bend over and put their hand on the ground, not Neal. Really impressed with how light on his feet he is especially for his size and man oh man, when he gets his hands on you, better luck next time. Looks to have good arm length from what I could tell but you don’t see his hands go out wide at the snap, showed good discipline keeping them inside. I didn’t get video of Neal while I was there but wanted to show you guys glimpses of why I was so impressed by him when I saw him with the following clips. As you’ll see on the first clip against Notre Dame commit, Nana Osafo-Mensah (6’4″ & 231-pounds), he is a big kid in his own right but Neal dwarfs him. Ball is snapped and you see the feet I mentioned but when Mensah tries to bull rush, Neal sticks those feet in the ground, keeps his hands inside for control and brings those hips. REP OVER in a hurry. Mekhail Sherman – The 2020 LB offer physically looks college ready right now and man can he run sideline to sideline. He was all over the place in the game vs Team Overdrive/OU. Even sniffing out a mis-direction trick type of play to Austin Stogner that if he wasn’t there would have been a big play. Plays with an attitude and loves to talk trash. Austin Stogner – Talk about a guy who understands route running and how to use his body to manipulate defenders to create space. Stogner was a star at the event and was named to the all tournament team on the offense. Showed off his big time ball skills catching passes in really tight windows as well as through contact. Just a vaccuum with the hands he has. Runs pretty well for his size but again, doesn’t matter if you run great or not when you understand the intricacies of how to use your body in routes against defenders who may be faster/quicker than he is. I’m a big Cowboys fan and have watched Jason Witten for years who excels with his route running, that’s who I am reminded of when I watch Stogner. Jase McClellan – First thing that jumped out to me when I saw Jase was that he looks bigger than 196-pounds. Kid has tree trunks for legs. And isn’t small in his upper body by any means but thats where I see some room to add some more weight to his frame. Liked how well he showed he can catch the ball but also showed at times his physical side not wanting to hold up and avoid contact during 7v7. Believe he tested well again which isn’t a surprise after how he performed at the Dallas Regional Camp. Really fits in well with Oklahoma likes to do with their backs. Grayson Boomer – Know he is committed to Oklahoma State but man oh man is he fun to watch run. It’s just easy for him. Kind of TE you can stick out wide to get him in space and stretch the field. While Stogner reminds me more of Witten with his route running, Boomer reminds me more of Mark Andrews and Jermaine Gresham with how well he runs. As I mentioned above, I was extremely impressed with what I saw from IMG OT Evan Neal. I can tell you that Oklahoma has been involved with Neal. From the little I was able to gather it sounds like they could be possibly working themselves into real consideration. *So spoke with a source regarding 2019 RB, Isaiah Spiller and where his recruitment is. We were under the impression that he was planning on returning to OU for a visit to the BBQ. While that may still be the case (working to confirm it), it’s looking like it really won’t matter. It sounds like a decision has been quietly made and OU isn’t the likely choice, I’m told. That shouldn’t come as a huge surprise. A) He does plan on committing later this summer…before the season starts. B) He still has his eye on visiting OU for the BBQ but said it is not 100%. I think OU’s fate here is completely tied to whether they can get him on campus for that event. If they do, there’s still a chance. If not, you can kiss it goodbye. Having said that, I’ve got a bit of confirmed good news on the running back front that I’ll pass along, shortly, that could mitigate any issues with Spiller. I spoke with Dax Hill to get a little more information directly from him about his recruiting timeline and to find out whether he will indeed attend the OU BBQ. *In terms of a commitment timeline he said, “early early August. I don’t have an exact date yet but it’s going to be really early in August”. So, I’d expect something to go down sometime in the first week of August. *As far as the BBQ goes, he said that he’d like to attend but he still hasn’t confirmed it with his parents. Essentially he said he’d like to attend if his parents are able to make it work. Obviously if he makes it on campus it would be great for OU but my big takeaway is that he clearly wants to make it. 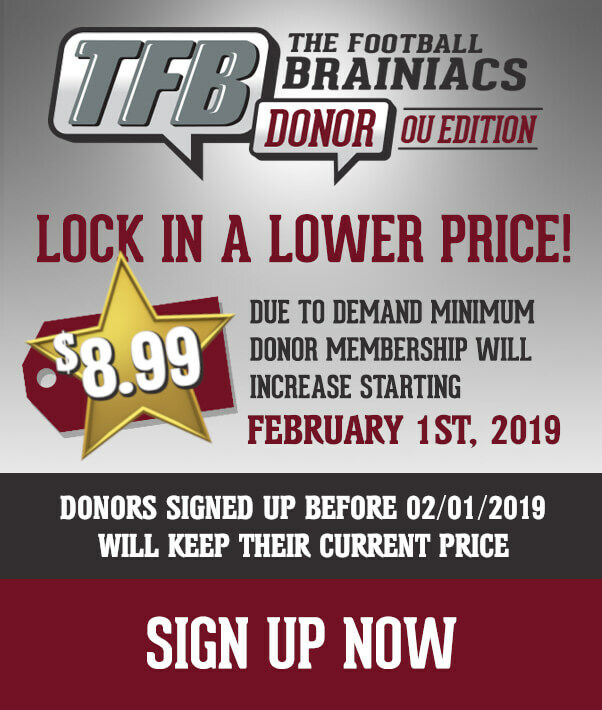 For more thoughts on Hill’s recruitment check out this TFB Donor Board link. Earlier this month Riley tweeted the famous eye emoji but these eyes weren’t like so many others. The eyes weren’t meant to indicate the Sooners had picked up a new recruit. They were meant to indicate the Sooners picked up a new staff hire. The Sooners are obviously waiting and hoping they land Dax but there are a few DBs that they continue to recruit in as they evaluate their needs and their numbers (which will obviously be adjusted depending on what Hill decides to do). I’m told Jalyn is certainly one of those players that the Sooners have continued to recruit. We do not anticipate Phillips being at the BBQ but an OV this fall is possible depending on how things play out in the next month. In fact, if the numbers are there, it’s probably safe to assume that Phillips does OV to Norman.